Enthusiasm for pool in the United Kingdom has spawned a host of aspiring governing bodies, an epidemic of acronyms and of course the inevitable inter-organisational squabbling. In the 1970s and 1980s pool really took off in the UK and the first national organisations were set up. The British Association of Pool Table Operators (BAPTO) was formed in 1975. BAPTO was established as a non-profit organisation seeking to unify the activities of those who supplied pool tables to the licensed trade. 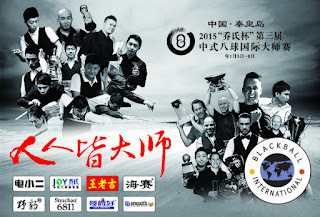 BAPTO published a standardised set of pool rules and ran their first national event in 1976. By the mid-80s the English Pool Association (EPA) had developed a county pool structure on behalf of England's players and leagues. It is regrettable that these two organisations, BAPTO and the EPA, had somehow contrived to implement differing versions of the rules. Attempts to establish a common set of rules in 1985 ended in bitterness. The ill will generated at that time affected the development of the game for years to come. The EPA subsequently affiliated to the World Eightball Pool Federation (WEPF) and the different rules and conflicting interests further intensified the divisions between the United Kingdom's pool organisations at both national and league level. Following the dust-up between BAPTO and the EPA another national organisation came into being. The United Kingdom Pool Federation (UKPF) was formed to represent the interests of Britain's 8ball players and to organise national pool events throughout the United Kingdom. BAPTO and the UKPF for a while at least became best buddies. 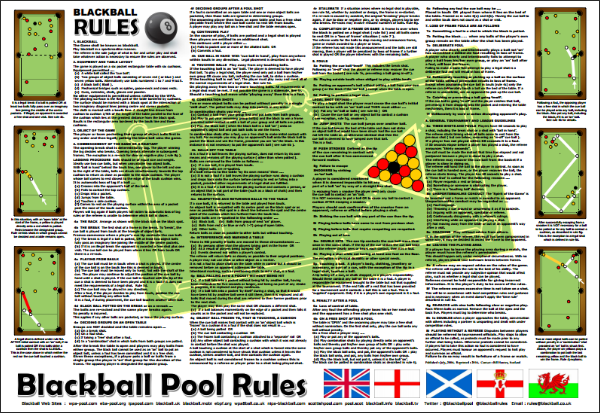 The image above shows the 8ball rules sheet published by the UKPF in 1992. The rules, as they stood at that time, have been reproduced in full below. Older players will perhaps also recall the BAPTO rules posters which were frequently displayed in British pubs and clubs. 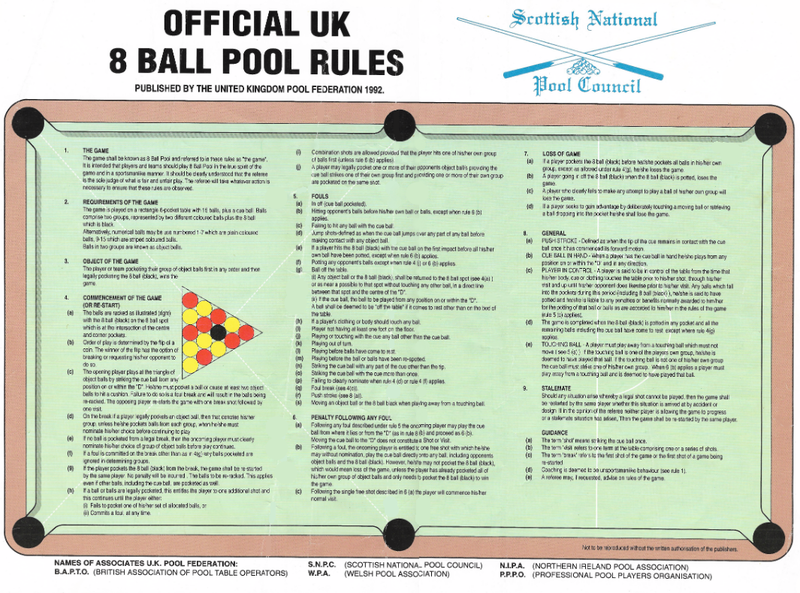 BAPTO pool rules were essentially identical to the UKPF rules reproduced here. UKPF/BAPTO rules may be thought of as the forerunner of blackball pool rules. 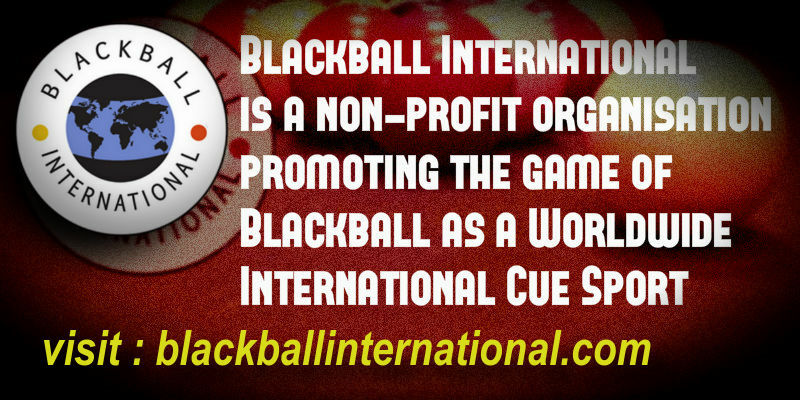 Many of the organisations which played to UKPF rules in the 1990s continue in existence today (in one form or another) and now recognise blackball as the premier rule-set for the small table game. Of the above organisations the SNPC became the Scottish Pool Association (SPA) and the PPPO has since been rejuvenated as the International Professional Pool Association (IPA). The other organisations listed above continue to this day (2016). English representation in the UKPF in 1992 was conspicuous by its absence. The English Pool Counties Federation (EPCF) was not formed until 1995. That organisation's remit was to administer the selection of players and teams which were invited to compete in national UKPF events. 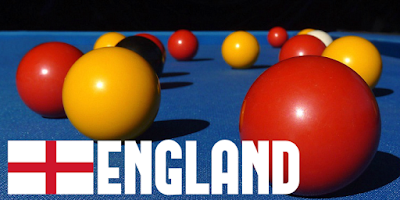 The EPCF is now the English Blackball Pool Federation (EBPF). Unsurprisingly the relationship between the UKPF and BAPTO was not entirely without acrimony. In the late 1990s there were disputes over the staging and location of national events. It seems that all too often in the history of the game there have been officials, not up to the job and motivated by personal ambition, who have been unwilling to step down or accept compromise. Inevitably this has not been in the best interests of the players. The UKPF broadened its role and became the European & United Kingdom Pool Federation (E&UKPF). In 2005 it was renamed the European Blackball Association (EBA). 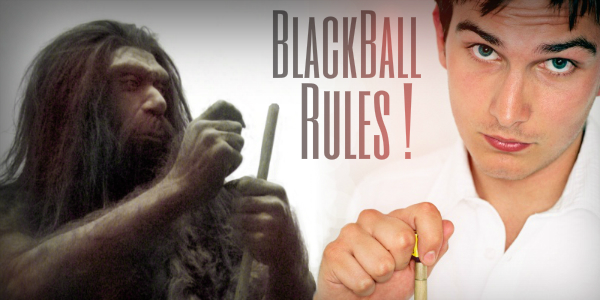 Minor changes to UKPF rules were introduced in the late 1990s but the most far-reaching changes came about in 2004 when blackball pool was sanctioned by the World Pool and Billiards Association (WPA). 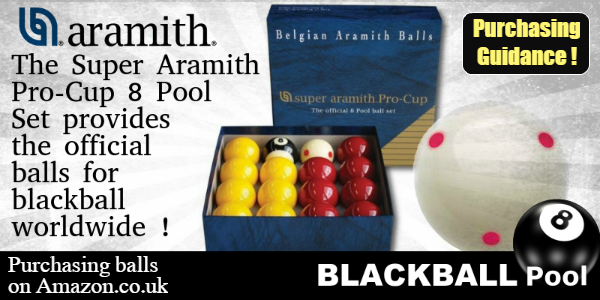 Thankfully blackball pool rules are now very much in the ascendancy in the United Kingdom and worldwide. The game shall be known as 8 Ball Pool and referred to in these rules as "the game". It is intended that players and teams should play 8 Ball Pool in the true spirit of the game and in a sportsmanlike manner. It should be clearly understood that the referee is the sole judge of what is fair and unfair play. The referee will take whatever action is necessary to ensure that these rules are observed. The game is played on a rectangle 6-pocket table with 15 balls, plus a cue ball. Balls comprise two groups, represented by two different coloured balls plus the 8 ball which is black. Alternatively, numerical balls may be use numbered 1-7 which are plain coloured balls, 9-15 which are striped coloured balls. Balls in two groups are known as object balls. The player or team pocketing their group of object balls first in any order and then legally pocketing the 8 ball (black), wins the game. 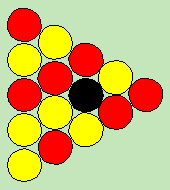 (a) The balls are racked as illustrated (right) with the 8 ball (black) on the 8 ball spot which is at the intersection of the centre and corner pockets. (b) Order of play is determined by the flip of a coin. The winner of the flip has the option of breaking or requesting his/her opponent to do so. (c) The opening player plays at the triangle of object balls by striking the cue ball from any position on or within the "D". He/she must pocket a ball or cause at least two object balls to hit a cushion. Failure to do so is a foul break and will result in the balls being re-racked. The opposing player re-starts the game with one break shot followed by one visit. (d) On the break if a player legally pockets an object ball, then that denotes his/her group, unless he/she pockets balls from each group, when he/she must nominate his/her choice before continuing to play. (e) If no ball is pocketed from a legal break, then the oncoming player must clearly nominate his/her choice of group of object balls before play continues. (f) If a foul is committed on the break other than as in 4(g) any balls pocketed are ignored in determining groups. (g) If the player pockets the 8 ball (black) from the break, the game shall be re-started by the same player. No penalty will be incurred. The balls to be re-racked. This applies even if other balls, including the cue ball, are pocketed as well. (ii) Commits a foul, at any time. (i) Combination shots are allowed provided that the player hits one of his/her own group of balls first (unless rule 6(b) applies). (j) A player may legally pocket one or more of their opponents object ball/s providing the cue ball strikes one of their own group first and providing one or more of their own group are pocketed on the same shot. (a) In off (cue ball pocketed). (b) Hitting opponent's balls before his/her own ball or balls, except when rule 6(b) applies. (c) Failing to hit any ball with the cue ball. (d) Jump shots-defined as when the cue ball jumps over any part of any ball before making contact with any object ball. (e) If a player hits the 8 ball (black) with the cue ball on the first impact before all his/her own ball have been potted, except when rule 6(b) applies. (f) Potting any opponent's balls except when rule 4(j) or 6(b) applies. (g) Ball off the table. (i) Any object ball or the 8 ball (black), shall be returned to the 8 ball spot (see 4(a)) or as near a possible to that spot without touching any other ball, in a direct line between that spot and the centre of the "D". (ii) If the cue ball, the ball to be played from any position on or within the "D". A ball shall be deemed to be "off the table" if it comes to rest other than on the bed of the table. (h) If a player's clothing or body should touch any ball. (i) Player not having at least one foot on the floor. (j) Playing or touching with the cue any ball other than the cue ball. (k) Playing out of turn. (l) Playing before balls have come to rest. (m) Playing before the ball or balls have been re-spotted. (n) Striking the cue ball with any part of the cue other than the tip. (o) Striking the cue ball with the cue more than once. (p) Failing to clearly nominate when rule 4(d) or rule 4(f) applies. (q) Foul break (see 4(c)). (r) Push stroke (see 8(a)). (s) Moving an object ball or the 8 ball black when playing away from a touching bail. (a) Following any foul described under rule 5 the oncoming player may play the cue ball from where it lies or from the "D" (as in rule 8(b) and proceed as 6(b). Moving the cue ball to the "D" does not constitute a Shot or Visit. (b) Following a foul, the oncoming player is entitled to one free shot with which he/she may without nomination, play the cue ball directly onto any ball, including opponents object balls and the 8 ball (black). However, he/she may not pocket the 8 ball (black), which would mean loss of the game, unless the player has already pocketed all of his/her own group of object balls and only needs to pocket the 8 ball (black) to win the game. (c) Following the single free shot described in 6(a) the player will commence his/her normal visit. 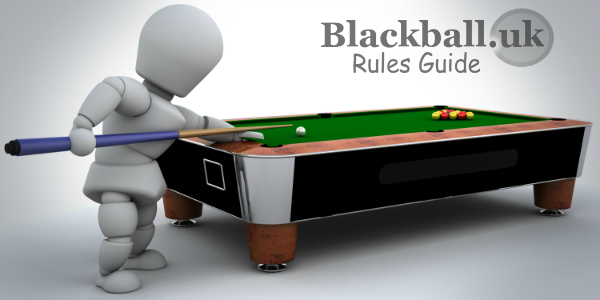 (a) If a player pockets the 8 ball (black) before he/she pockets all balls in his/her own group, except as allowed under rule 4(g), he/she loses the game. (b) A player going in off the 8 ball (black) when the 8 ball (black) is potted, loses the game. (c) A player who clearly fails to make any attempt to play a ball of his/her own group will lose the game. (d) If a player seeks to gain advantage by deliberately touching a moving ball or retrieving a ball dropping into the pocket he/she shall lose the game. (a) PUSH STROKE - Defined as when the tip of the cue remains in contact with the cue ball once it has commenced its forward motion. (b) CUE BALL IN HAND - When a player has the cue ball in hand he/she plays from any position on or within the "D" and in any direction. (c) PLAYER IN CONTROL - A player is said to be in control of the table from the time that his/her body, cue or clothing touches the table prior to his/her shot, through his/her visit and up until his/her opponent does likewise prior to his/her visit. Any balls which fall into the pockets during this period (including 8 ball (black) ), he/she is said to have potted and he/she is liable to any penalties or benefits normally awarded to him/her for the potting of that ball or balls as are accorded to him/her in the rules of the game (rule 5(c) applies). (d) The game is completed when the 8 ball (black) is potted in any pocket and all the remaining balls including the cue ball have come to rest, except where rule 4(g) applies. (e) TOUCHING BALL - A player must play away from a touching ball which must not move (see 5(s)). If the touching ball is one of the players own group, he/she is deemed to have played that ball. If the touching ball is not one of his/her own group the cue ball must strike one of his/her own group. When 6(b) applies a player must play away from a touching ball and is deemed to have played that ball. Should any situation arise whereby a legal shot cannot be played, then the game shall be restarted by the same player whether this situation is arrived at by accident or design. If in the opinion of the referee neither player is allowing the game to progress or a stalemate situation has arisen, Then the game shall be re-started by the same player. (a) The term 'shot' means striking the cue ball once. (b) The term 'visit' refers to one term at the table comprising one or a series of shots. (c) The term 'break' refers to the first shot of the game or the first shot of a game being re-started. (d) Coaching is deemed to be unsportsmanlike behaviour (see rule 1). (e) A referee may, if requested, advise on rules of the game. We have seen that behind the scenes politics, personal power struggles and inter-organisational acrimony are nothing new in pool. In February 2018 it was announced that Martin Kirwan and Margarite Lopez, formerly president and secretary of Blackball International, had resigned. It was said that the European Blackball Association made these resignations a condition of the EBA's continuing support for the BI's 2018 World Championships. Subsequently the newly installed President indicated he will work with the EBA to organise the World Blackball Championships in 2018.